How do I get my children to add value to their learning via the smart phone or tablet. How do I teach them about the environment at large when all they do is spend time online at home instead of being outdoors as I used to be. Recently, I had the privilege of meeting a young entrepreneur Akshaat Singh who is running a subsidiary to a U.S. based firm by the name of ‘Junior Explorers Pte Ltd’ that has grappled with the very same questions and has taken the initiative of designing a program by the name of ‘Junior Explorers’ for us. The program is involved in steering the next generation towards environmental awareness by leveraging the very addictive ‘being online’ phenomenon in children. It is then only apt that FUCHSIA brings to you the newest experience that has just hit Singapore – ‘Junior Explorers’. The Junior Explorers Club is a monthly subscription based program aimed at children between the ages of 5 and 12. The program encapsulates the environmental challenges that our planet faces in today’s day and age by tying it up with fun trivia and games that heighten children’s interest such that they become ecologically savvy and grow up to be environmentally conscious adults. The program comprises of two modules. Each month, the children will be given a mission. They will receive a physical kit in the mail (which in itself will cause great excitement for the children) with cool collectibles, stickers etc along with information about that particular month’s ecosystem and mission. The kit will also contain login details for the online experience – and that is where the actual mission will commence and end. The second component – the online experience is one in which the children will visit a new ecosystem every month increasing their knowledge about it as well as some of the iconic species that inhabit that space alongside highlighting some of the conservation threats it faces. Best part about the online experience – the children can revisit their favorite games as many times as they would like. Junior Explorer has already been launched in the U.S. (current user base of 1,500) with great feedback and its popularity is soon to follow suit in Singapore. Interestingly, Junior Explorers has included something called ‘Mission Giveback’. Once the children reach the end of their mission, they have a count of the total points they have earned. These points are converted into actual cash. The children are then given a choice between 2-3 NGOs to select from for donating this cash. Along with this, for each sign up the company receives, it donates SGD10 to a partnering NGO. This gives the children a sense of duty towards the environment, makes them aware of the organizations (by name and by task) that are actively working on conservation and enables them to get a sense of what it feels like to be a philanthropist. Junior Explorers Pte Ltd is a US and Singapore based social enterprise focused on spreading education and awareness about wildlife, the environment and conservation. They are NOT an NGO and do not do any active in-the-field conservation projects, but aim to leverage the digital assets they have at hand to create innovative products and experiences that help create a more aware and involved global community. They especially want to reach out to children and the younger generation, and their long-term mandate is to foster the next generation of ‘environmental stewards’. I have a daughter, she is 5 and she loves animals. I decided to get her and myself to experience Junior Explorers first hand. First of all, when we received the starter kit, there was a look of wonderment on my daughter’s face. There is something classically retro about receiving a physical package with your name on it! 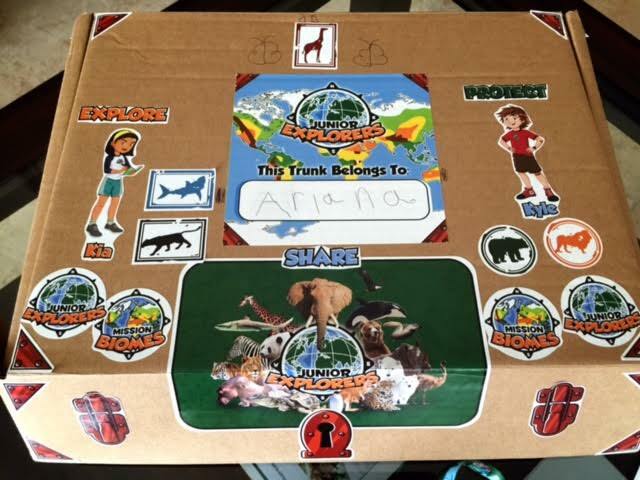 The ‘starter kit’ plays the perfect role of acquainting the children with Junior Explorer. 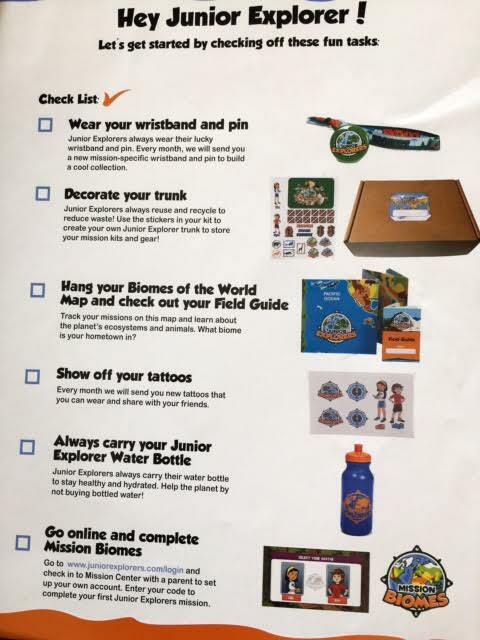 It includes a welcome note, a checklist of things to do, field guide with information on the different biomes of the world, fun things (such as tattoos, water bottle, badge, stickers, a huge world map highlighting various biomes etc). It was amazing to see how quickly my daughter was engaged in the activities and immediately wanted to check off the tasks on the list. Then came the ‘mission kit’. You will receive one every month with each mission kit focused on one particular biome. Out first mission was in the Arctic where we were to find a lost baby polar bear’s mommy. The mission kit includes a special code that you are to use to unlock the online mission. This henceforth starts the children off on a great adventure step by step with the help of Kyle and Kia – two very adventurous and relatable kids. The mission sets forth in a very organized fashion that begins from the kind of clothing and equipment that would be suitable for that particular environment while enriching the children’s knowledge by throwing in facts about that ecosystem. I was surprised to see my daughter taking up the responsibility of finding the polar bear mom (while holding the cute little plastic polar bear that came in the starter kit). She did not rest till we ended the mission. A perfect afternoon well spent! Each mission on average takes 2 hours to complete. Everything in the kit is eco-friendly. The paper is FSC certified and recycled. The bottle is BPA free. The online mission does not have any audio – reason being the company wanted to inculcate the habit of reading in kids, which is great for older kids but for 5-7 year olds it might be slightly tough and may need parental assistance. As my five year old said to me while on her first mission set in the Arctics – mama I am extremely worried about the polar bear – the look of worry on her face was priceless and the hidden smile on my face boundless. I would say ‘Junior Explorers’ has begun creating that army – wouldn’t you agree? Mehvish Maniar holds an MBA degree in Finance from the Institute of Business Management in Pakistan. Her eight years of working in the field of Treasury, include her work at Jehangir Siddiqui Capital Markets, Deutsche Bank and Barclays Bank. Mehvish put her career on hold after the birth of her first child; she likes to read, watch movies, listen to music and is interested in all things related to art.